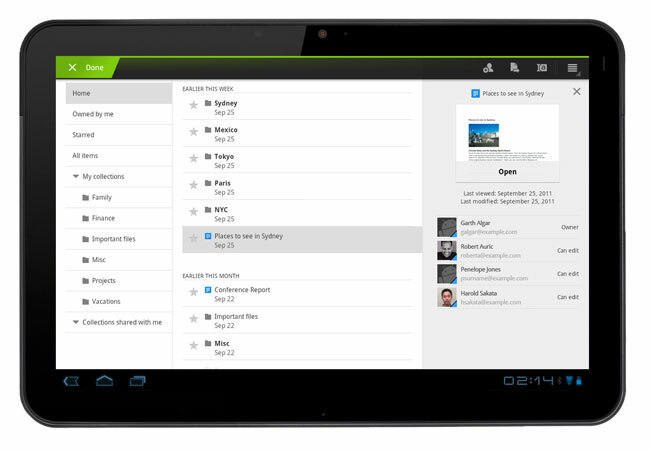 Google Docs for Android was released earlier this year and has been a very popular application with Android users. This week Google has now rolled out a new update that makes the application even easier to use on Android tablet devices. The new Android Google Docs app update includes an entirely new design, specifically customised for the larger screen space on tablets and now includes three-panel view, that allows you to navigate through filters and collections, view your document list, and see document details all from one screen. On the right side of the new interface, a thumbnail preview of a document can be seen with details of what it contains before opening it, with extra details providing information on who viewed or edit any doc. You can download the app from the Android Market and the new features are now available in 46 languages on tablet devices with Android 3.0+ (Honeycomb) and above.